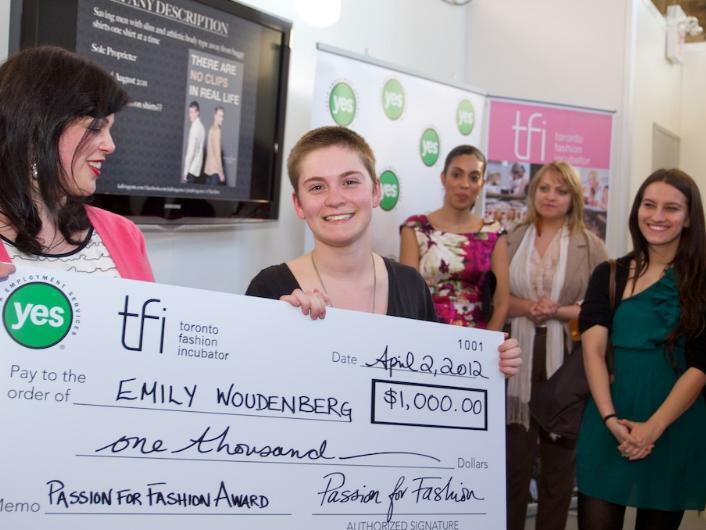 On Monday, April 2, 2012, the third annual Passion For Fashion Awards took place at the Toronto Fashion Incubator (TFI). Renowned fashion designer David Dixon presented the Eveleen Dollery Awards. Find out more about Eveleen Dollery and her legacy here. Sponsors included: Winners, PR Department, Revive Magazine, Sigmacon, Great Lakes Brewery, and Sweat Shoppe. Twelve finalists competed in the Fashionista’s Den Competition on Monday, March 26, 2012. The finalists also included: Candice Faust, Kallvis Gents, Violetta Holl, Andy Jones, Natalia Kelenc, Sin-Young Gloria Kim, Sage Paul, Pranavi Suthagar, and Nadine Woods. For more information, please contact Gail McInnes at gail_mcinnes@yes.on.ca, or visit yes.on.ca/passionforfashion. Born from of a partnership between two cutting-edge organizations, A Passion for Fashionmarries Youth Employment Services YES’s expertise in youth entrepreneurship with theToronto Fashion Incubator’s (TFI) success in inspiring new fashion design talent between the age of 16 – 29. Now in its third year, this exciting program gives young fashion designers and entrepreneurs the opportunity to explore the world of entrepreneurship in the fashion industry, for FREE! The program is funded by the Ministry of Ontario’s Youth Entrepreneurship Program. Opportunity to enter the Fashionista’s Den Competition to win $1,000 cash, a one-year membership to TFI and 50 hours of business advisory and fashion mentorship for free! I was at the 2012 passion for fashion event at the Toronto fashion incubator. Does anybody know where I could find photos of the event?